To return the Bill, intituled, "An Act for vesting the Seat and Estates of Nicholas late Earl of Scarsdale, deceased, in the several Counties of Derby and Nottingham, comprized in his Settlement and Will, and the Furniture there at his Death, in Trustees, to be sold, for speedier Payment of his Debts, and preserving the Surplus to go according to his said Settlement and Will;" and to acquaint this House, that they have agreed to the same, without any Amendment. To return the Bill, intituled, "An Act for naturalizing Gedeon Bourdillon and John David Billon;" and to acquaint this House, that they have agreed to their Lordships Amendments made thereto. 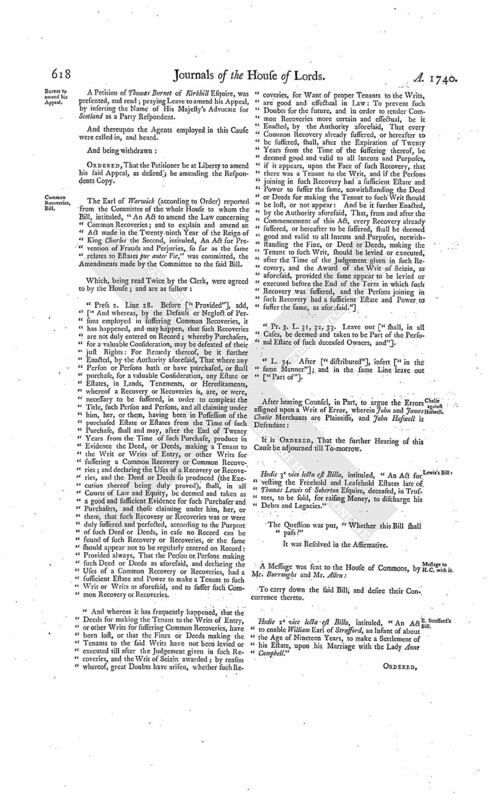 With a Bill, intituled, "An Act to enlarge the Terms and Powers granted by Three several Acts, made in the Ninth and Twelfth Years of the Reign of Her late Majesty Queen Anne, and in the Thirteenth Year of the Reign of His late Majesty King George the First, for amending the Highways leading from Royston, in the County of Hertford, to Wandsford Bridge, in the County of Huntingdon, so far as the same relate to the Roads lying in the Middle and South Divisions of the said Highways;" to which they desire the Concurrence of this House. 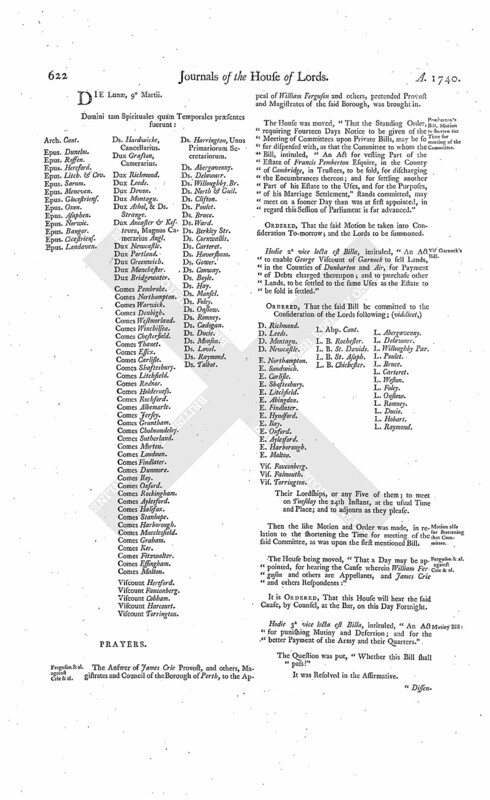 With a Bill, intituled, "An Act for repairing the Road from Wakefield to Pontefract, and from thence to a Place called Weeland, in the Township of Hensall, and from Pontefract to Wentbridge, in the Township of Darrington, in the West Riding of the County of York;" to which they desire the Concurrence of this House. Against delaying Causes after Issue joined, Bill. With a Bill, intituled, "An Act to prevent Inconveniencies arising from Delays of Causes after Issue joined;" to which they desire the Concurrence of this House. D. of Beaufort and D. of Portland's Bill. Hodie 2a vice lecta est Billa, intituled, "An Act for establishing and confirming a Partition agreed to be made, between Henry Duke of Beaufort and William Duke of Portland, of the several Manors, Messuages, Lands, Tenements, and Hereditaments, in the Counties of Southampton and Wilts, whereof they are seised as Tenants in Common; and for settling their specific Shares and Allotments to such Uses as their undivided Moieties thereof now stand limited; and for other Purposes therein mentioned." Their Lordships, or any Five of them; to meet at the usual Time and Place, on Tuesday the 17th Instant; and to adjourn as they please. The Earl of Oxford reported from the Lords Committees to whom the Bill, intituled, "An Act to enable Francis Thistlethwaite Esquire, and the Heirs Male of his Body, to take and use the Surname of Whithed, pursuant to the Will and Codicils of Richard Whithed Esquire, deceased," was committed: "That they had considered the said Bill, and examined the Allegations thereof, which they found to be true; and that the Committee had gone through the Bill, and directed him to report the same to the House, without any Amendment." The Earl of Warwick reported from the Lords Committees to whom the Bill, intituled, "An Act for vesting certain Manors, Lands, and Tenements, of William Hudleston Esquire, in Trustees, to be sold, for Payment of his Debts," was committed: "That they had considered the said Bill, and examined the Allegations thereof, which they found to be true; that the Parties concerned had given their Consents; and that the Committee had gone through the Bill, and made some Amendments thereunto." Hodie 1a vice lecta est Billa, intituled, "An Act for explaining and making more effectual an Act, made in the Twelfth Year of the Reign of His present Majesty, intituled, An Act for discharging Part of the settled Estate of William Earl Cowper, in the County of Hertford, from the Uses and Limitations of a former Settlement; and for settling and securing an Equivalent for the same, to the like Uses." Hodie 1a vice lecta est Billa, intituled, "An Act for vacating a Term of One Hundred Years, in a voluntary Settlement made by Sir Hugh Clopton Knight; and for creating a new Term of One Thousand Years, in Lieu thereof, for the Purposes therein mentioned." Reports upon Turnpike Bills, to be received. Ordered, That the several Reports from the Committees to whom Bills relating to Turnpikes have been committed be received To-morrow Sevennight; and the Lords to be summoned. 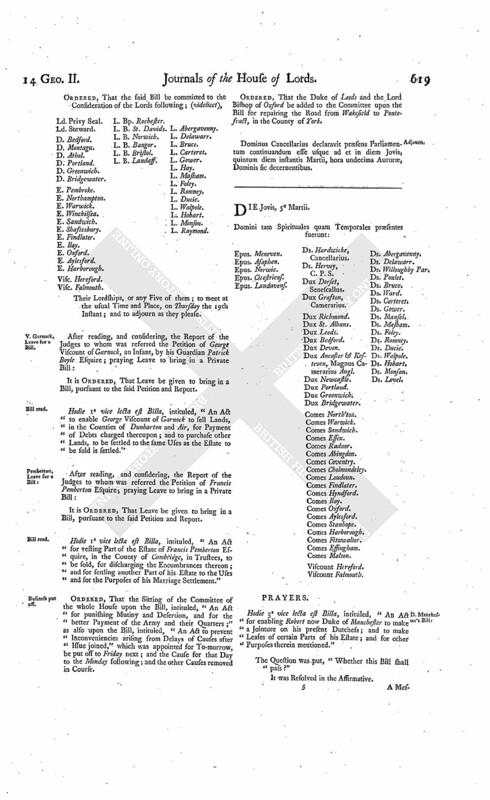 The House (according to Order) was adjourned during Pleasure, and put into a Committee upon the Bill, intituled, "An Act to amend the Law concerning Common Recoveries; and to explain and amend an Act, made in the Twenty-ninth Year of the Reign of King Charles the Second, intituled, An Act for Prevention of Frauds and Prejudices, so far as the same relates to Estates pur auter Vie." And the Earl of Warwick reported from the said Committee, "That they had made a further Progress in the Matter to them referred." Ordered, That the House be put into a Committee again, upon the said Bill, To-morrow. The Earl of Warwick reported from the Lords Committees to whom it was referred to examine into the printing and publishing certain Books, intituled, "A Complete Collection of Debates in Parliament, both Lords and Commons, &c." in Nine Volumes Octavo, mentioned to be sold by John Torbuck, in Clare-Court, Drury Lane: "That the Committee, in Pursuance of the Direction of the House, met to inquire into the Matter to them referred; and were, according to their Lordships Order, attended by John Torbuck; who owned to the Committee, "That he was the Printer and Publisher of the said Books; and that he printed the same from a printed Copy of the said Books, which he purchased of John Smith, Bookseller in Dublin;" but the said John Torbuck refuses to name any of the Persons whom he employed in printing the said Books." Ordered, That the Gentleman Usher of the Black Rod do forthwith attach the Body of the said John Torbuck, for his said Offence; and do convey, or cause him to be conveyed, to the Prison of Newgate, and delivered to the Keeper thereof, to be by him safely kept during the Pleasure of this House; and this shall be a sufficient Warrant on that Behalf. To Sir Charles Dalton Knight, Gentleman Usher of the Black Rod, his Deputy or Deputies, and every of them; and also to the Keeper of Newgate, his Deputy or Deputies, and every of them. Dominus Cancellarius declaravit præsens Parliamentum continuandum esse usque ad et in diem Martis, tertium diem instantis Martii, hora undecima Auroræ, Dominis sic decernentibus. With a Bill, intituled, "An Act for repairing the Roads from Doncaster, through Ferry Bridge, to the South Side of Tadcaster Cross, and also from Ferry Bridge to Weatherby, and from thence to Burrough Bridge, in the County of York;" to which they desire the Concurrence of this House. Lords added to Committee for the Journal. Ordered, That all the Lords who have been, or shall be, present in the House this Session of Parliament, and are not of the Committee appointed the First Day of this Session to peruse and perfect the Journals of this and former Sessions of Parliament, be added to the said Committee. Hodie 2a vice lecta est Billa, intituled, "An Act for repairing the Road from Wakefield to Pontefract, and from thence to a Place called Weeland, in the Township of Hensall, and from Pontefract to Wentbridge, in the Township of Darrington, in the West Riding of the County of York." L. B. Landaff. Ld. Harrington, Sec. Hodie 2a vice lecta est Billa, intituled, "An Act for explaining and making more effectual an Act, made in the Twelfth Year of the Reign of His present Majesty, intituled, An Act for discharging Part of the settled Estate of William Earl Cowper, in the County of Hertford, from the Uses and Limitations of a former Settlement; and for settling and securing an Equivalent for the same, to the like Uses." Their Lordships, or any Five of them; to meet at the usual Time and Place, on Wednesday the 18th Instant; and to adjourn as they please. Hodie 2a vice lecta est Billa, intituled, "An Act for vacating a Term of One Hundred Years, in a voluntary Settlement made by Sir Hugh Clopton Knight; and for creating a new Term of One Thousand Years in Lieu thereof, for the Purposes therein mentioned." Their Lordships, or any Five of them; to meet on the same Day at the same Place; and to adjourn as they please. Hodie 2a vice lecta est Billa, intituled, "An Act to enlarge the Terms and Powers granted by Three several Acts, made in the Ninth and Twelfth Years of the Reign of Her late Majesty Queen Anne, and in the Thirteenth Year of the Reign of His late Majesty King George the First, for amending the Highways leading from Royston, in the County of Hertford, to Wandsford Bridge, in the County of Huntingdon, so far as the same relate to the Roads lying in the Middle and South Divisions of the said Highways." Their Lordships, or any Five of them; to meet at the usual Place on Thursday next; and to adjourn as they please. Hodie 3a vice lecta est Billa, intituled, "An Act to explain and amend an Act, made in the Third Year of the Reign of King James the First, intituled, An Act for the recovering of small Debts, and for the relieving of poor Debtors, in London." Hodie 3a vice lecta est Billa, intituled, "An Act for vesting certain Manors, Lands, and Tenements, of William Hudleston Esquire, in Trustees, to be sold, for Payment of his Debts." Hodie 3a vice lecta est Billa, intituled, "An Act to enable Francis Thistlethwaite Esquire, and the Heirs Male of his Body, to take and use the Surname of Whithed, pursuant to the Will and Codicils of Richard Whithed Esquire, deceased." Hodie 2a vice lecta est Billa, intituled, "An Act for punishing Mutiny and Desertion; and for the better Payment of the Army and their Quarters." The Earl of Warwick reported from the Lords Committees to whom the Bill, intituled, "An Act for vesting the Freehold and Leasehold Estates late of Thomas Lewis of Soberton Esquire, deceased, in Trustees, to be sold, for raising Money to discharge his Debts and Legacies," was committed: "That they had considered the said Bill, and examined the Allegations thereof, which they found to be true; that the Parties concerned had given their Consents; and that the Committee had gone through the Bill, and made some Amendments thereunto." Ordered, That the said Bill, with the Amendments; be engrossed. Upon reading the Petition and Appeal of Charles Cajetan Count Leslie; complaining of an Interlocutor of the Lords of Session in Scotland, of the 20th of February last, made on the Behalf of James Leslie of Pitcaple Esquire; and praying, "That the same may be reversed; and that the Appellant may have such Relief as to the House in their great Wisdom shall seem meet:"
It is Ordered, That the said James Leslie may have a Copy of the said Appeal; and he is hereby required to put in his Answer thereunto, in Writing, on or before Tuesday the 30th Day of this Instant March; and that Service of this Order on his Procurators or Agents in the said Court be deemed good Service. 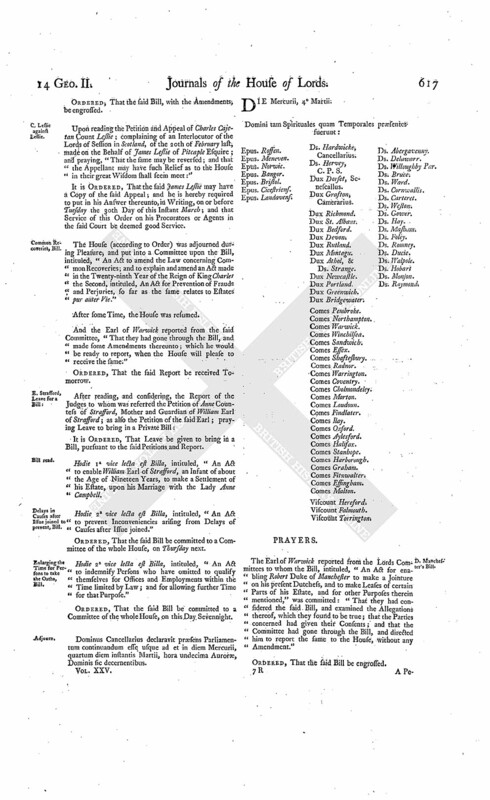 The House (according to Order) was adjourned during Pleasure, and put into a Committee upon the Bill, intituled, "An Act to amend the Law concerning Common Recoveries; and to explain and amend an Act made in the Twenty-ninth Year of the Reign of King Charles the Second, intituled, An Act for Prevention of Frauds and Perjuries, so far as the same relates to Estates pur auter Vie." Hodie 1a vice lecta est Billa, intituled, "An Act to enable William Earl of Strafford, an Infant of about the Age of Nineteen Years, to make a Settlement of his Estate, upon his Marriage with the Lady Anne Campbell. Delays in Causes after Issue joined to prevent, Bill. Hodie 2a vice lecta est Billa, intituled, "An Act to prevent Inconveniencies arising from Delays of Causes after Issue joined." Dominus Cancellarius declaravit præsens Parliamentum continuandum esse usque ad et in diem Mercurii, quartum diem instantis Martii, hora undecima Auroræ, Dominis sic decernentibus. The Earl of Warwick reported from the Lords Committees to whom the Bill, intituled, "An Act for enabling Robert Duke of Manchester to make a Jointure on his present Dutchess, and to make Leases of certain Parts of his Estate, and for other Purposes therein mentioned," was committed: "That they had considered the said Bill, and examined the Allegations thereof, which they found to be true; that the Parties concerned had given their Consents; and that the Committee had gone through the Bill, and directed him to report the same to the House, without any Amendment." Burnet to amend his Appeal. A Petition of Thomas Burnet of Kirkhill Esquire, was presented, and read; praying Leave to amend his Appeal, by inserting the Name of His Majesty's Advocate for Scotland as a Party Respondent. And thereupon the Agents employed in this Cause were called in, and heard. Ordered, That the Petitioner be at Liberty to amend his said Appeal, as desired; he amending the Respondents Copy. The Earl of Warwick (according to Order) reported from the Committee of the whole House to whom the Bill, intituled, "An Act to amend the Law concerning Common Recoveries; and to explain and amend an Act made in the Twenty-ninth Year of the Reign of King Charles the Second, intituled, An Act for Prevention of Frauds and Perjuries, so far as the same relates to Estates pur auter Vie," was committed, the Amendments made by the Committee to the said Bill. "Press 2. Line 28. Before ["Provided"], add, ["And whereas, by the Default or Neglect of Persons employed in suffering Common Recoveries, it has happened, and may happen, that such Recoveries are not duly entered on Record; whereby Purchasers, for a valuable Consideration, may be defeated of their just Rights: For Remedy thereof, be it further Enacted, by the Authority aforesaid, That where any Person or Persons hath or have purchased, or shall purchase, for a valuable Consideration, any Estate or Estates, in Lands, Tenements, or Hereditaments, whereof a Recovery or Recoveries is, are, or were, necessary to be suffered, in order to compleat the Title, such Person and Persons, and all claiming under him, her, or them, having been in Possession of the purchased Estate or Estates from the Time of such Purchase, shall and may, after the End of Twenty Years from the Time of such Purchase, produce in Evidence the Deed, or Deeds, making a Tenant to the Writ or Writs of Entry, or other Writs for suffering a Common Recovery or Common Recoveries; and declaring the Uses of a Recovery or Recoveries, and the Deed or Deeds so produced (the Execution thereof being duly proved), shall, in all Courts of Law and Equity, be deemed and taken as a good and sufficient Evidence for such Purchaser and Purchasers, and those claiming under him, her, or them, that such Recovery or Recoveries was or were duly suffered and perfected, according to the Purport of such Deed or Deeds, in case no Record can be found of such Recovery or Recoveries, or the same should appear not to be regularly entered on Record: Provided always, That the Person or Persons making such Deed or Deeds as aforesaid, and declaring the Uses of a Common Recovery or Recoveries, had a sufficient Estate and Power to make a Tenant to such Writ or Writs as aforesaid, and to suffer such Common Recovery or Recoveries. "Pr. 3. L. 31, 32, 33. Leave out ["shall, in all Cases, be deemed and taken to be Part of the Personal Estate of such deceased Owners, and"]. "L. 34. After ["distributed"], insert ["in the same Manner"]; and in the same Line leave out ["Part of"]. Hodie 3a vice lecta est Billa, intituled, "An Act for vesting the Freehold and Leasehold Estates late of Thomas Lewis of Soberton Esquire, deceased, in Trustees, to be sold, for raising Money, to discharge his Debts and Legacies." Hodie 2a vice lecta est Billa, intituled, "An Act to enable William Earl of Strafford, an Infant of about the Age of Nineteen Years, to make a Settlement of his Estate, upon his Marriage with the Lady Anne Campbell." Visc. Falmouth. L. Bp. Rochester. Their Lordships, or any Five of them; to meet at the usual Time and Place, on Thursday the 19th Instant; and to adjourn as they please. V. Garnock, Leave for a Bill. Hodie 1a vice lecta est Billa, intituled, "An Act to enable George Viscount of Garnock to sell Lands, in the Counties of Dunbarton and Air, for Payment of Debts charged thereupon; and to purchase other Lands, to be settled to the same Uses as the Estate to be sold is settled." Hodie 1a vice lecta est Billa, intituled, "An Act for vesting Part of the Estate of Francis Pemberton Esquire, in the County of Cambridge, in Trustees, to be sold, for discharging the Encumbrances thereon; and for settling another Part of his Estate to the Uses and for the Purposes of his Marriage Settlement." 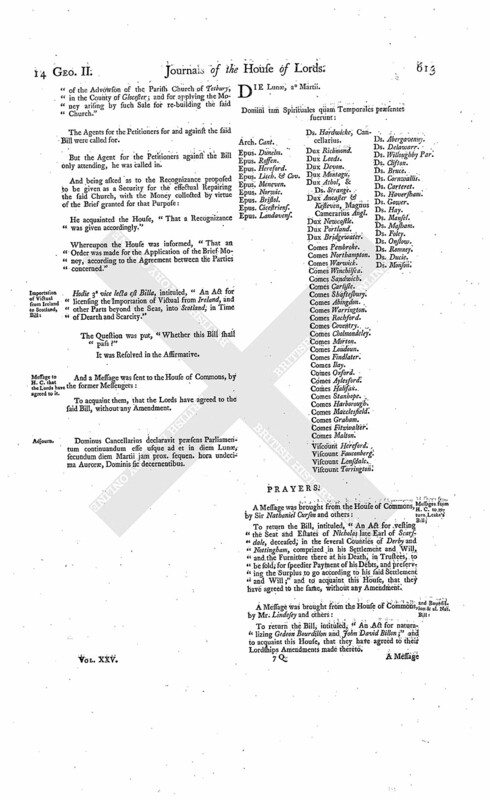 Ordered, That the Sitting of the Committee of the whole House upon the Bill, intituled, "An Act for punishing Mutiny and Desertion, and for the better Payment of the Army and their Quarters;" as also upon the Bill, intituled, "An Act to prevent Inconveniencies arising from Delays of Causes after Issue joined," which was appointed for To-morrow, be put off to Friday next; and the Cause for that Day to the Monday following; and the other Causes removed in Course. 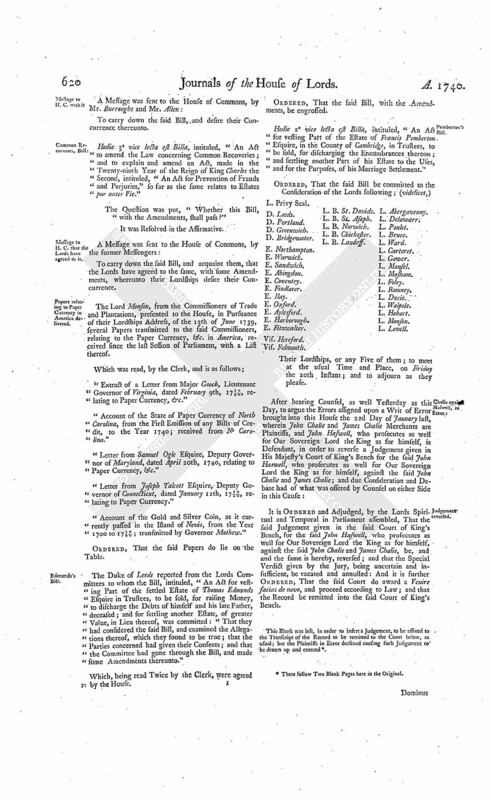 Ordered, That the Duke of Leeds and the Lord Bishop of Oxford be added to the Committee upon the Bill for repairing the Road from Wakefield to Pontefract, in the County of York. Dominus Cancellarius declaravit præsens Parliamentum continuandum esse usque ad et in diem Jovis, quintum diem instantis Martii, hora undecima Auroræ, Dominis sic decernentibus. Hodie 3a vice lecta est Billa, intituled, "An Act for enabling Robert now Duke of Manchester to make a Jointure on his present Dutchess; and to make Leases of certain Parts of his Estate; and for other Purposes therein mentioned." Hodie 3a vice lecta est Billa, intituled, "An Act to amend the Law concerning Common Recoveries; and to explain and amend an Act, made in the Twenty-ninth Year of the Reign of King Charles the Second, intituled, "An Act for Prevention of Frauds and Perjuries," so far as the same relates to Estates pur auter Vie." To carry down the said Bill, and acquaint them, that the Lords have agreed to the same, with some Amendments, whereunto their Lordships desire their Concurrence. Papers relating to Paper Currency in America delivered. The Lord Monson, from the Commissioners of Trade and Plantations, presented to the House, in Pursuance of their Lordships Address, of the 13th of June 1739, several Papers transmitted to the said Commissioners, relating to the Paper Currency, &c. in America, received since the last Session of Parliament, with a List thereof. "Extract of a Letter from Major Gooch, Lieutenant Governor of Virginia, dated February 9th, 1739/40, relating to Paper Currency, &c."
"Account of the State of Paper Currency of North Carolina, from the First Emission of any Bills of Credit, to the Year 1740; received from No Carolina." "Letter from Samuel Ogle Esquire, Deputy Governor of Maryland, dated April 20th, 1740, relating to Paper Currency, &c."
"Letter from Joseph Talcott Esquire, Deputy Governor of Connecticut, dated January 12th, 1739/40, relating to Paper Currency." "Account of the Gold and Silver Coin, as it currently passed in the Island of Nevis, from the Year 1700 to 1739/40; transmitted by Governor Mathew." The Duke of Leeds reported from the Lords Committees to whom the Bill, intituled, "An Act for vesting Part of the settled Estate of Thomas Edmunds Esquire in Trustees, to be sold, for raising Money, to discharge the Debts of himself and his late Father, deceased; and for settling another Estate, of greater Value, in Lieu thereof, was committed: "That they had considered the said Bill, and examined the Allegations thereof, which they found to be true; that the Parties concerned had given their Consents; and that the Committee had gone through the Bill, and made some Amendments thereunto." Which, being read Twice by the Clerk, were agreed by the House. Hodie 2a vice lecta est Billa, intituled, "An Act for vesting Part of the Estate of Francis Pemberton Esquire, in the County of Cambridge, in Trustees, to be sold, for discharging the Encumbrances thereon; and settling another Part of his Estate to the Uses, and for the Purposes, of his Marriage Settlement." Vis. Falmouth. L. B. St. Davids. Their Lordships, or any Five of them; to meet at the usual Time and Place, on Friday the 20th Instant; and to adjourn as they please. 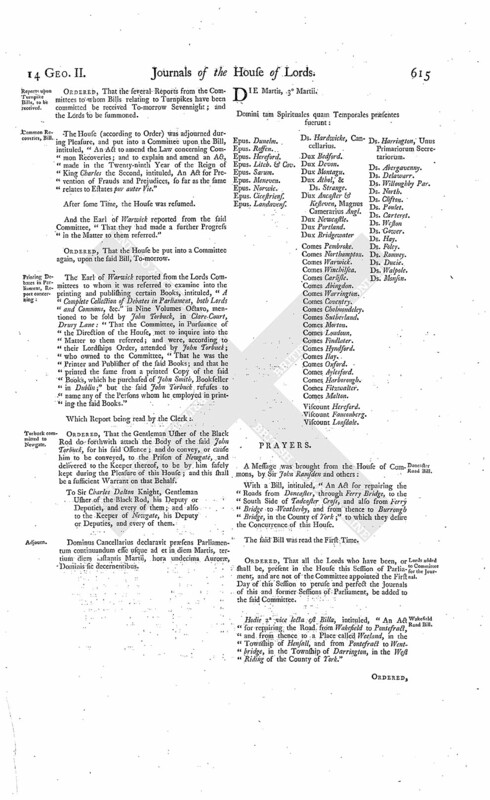 It is Ordered and Adjudged, by the Lords Spiritual and Temporal in Parliament assembled, That the said Judgement given in the said Court of King's Bench, for the said John Haswell, who prosecutes as well for Our Sovereign Lord the King as for himself, against the said John Chalie and James Chalie, be, and and the same is hereby, reversed; and that the Special Verdict given by the Jury, being uncertain and insufficient, be vacated and annulled: And it is further Ordered, That the said Court do award a Venire facias de novo, and proceed according to Law; and that the Record be remitted into the said Court of King's Bench. This Blank was left, in order to insert a Judgement, to be affixed to the Transcript of the Record to be remitted to the Court below, as usual; but the Plaintiffs in Error declined causing such Judgement to be drawn up and entered (fn. 1). Dominus Cancellarius declaravit præsens Parliamentum continuandum esse usque ad et in diem Veneris, sextum diem instantis Martii, hora undecima Auroræ, Dominis sic decernentibus. The Lord Delawarr reported from the Lords Committees to whom the Bill, intituled, "An Act for supplying the City of Gloucester with fresh Water," was committed: "That they had considered the said Bill, and examined the Allegations thereof, which they found to be true; and that the Committee had gone through the Bill, and directed him to report the same to the House, without any Amendment." Hodie 3a vice lecta est Billa, intituled, "An Act for vesting Part of the settled Estate of Thomas Edmunds Esquire in Trustees, to be sold, for raising Money, to discharge the Debts of himself and his late Father, deceased; and for settling another Estate, of greater Value, in Lieu thereof." Recovery of small Debts, Bill. With a Bill, intituled, "An Act for the more easy Recovery of small Debts;" to which they desire the Concurrence of this House. The House (according to Order) was adjourned during Pleasure, and put into a Committee upon the Bill, intituled, "An Act for punishing Mutiny and Desertion; and for the better Payment of the Army and their Quarters." Delays of Causes to prevent, Bill. The House (according to Order) was adjourned during Pleasure, and put into a Committee upon the Bill, intituled, "An Act to prevent Inconveniencies arising from Delays of Causes after Issue joined." Dominus Cancellarius declaravit præsens Parliamentum continuandum esse usque ad et in diem Lunæ, nonum diem instantis Martii, hora undecima Auroræ, Dominis sic decernentibus. Ferguson & al. against Crie & al. The Answer of James Crie Provost, and others, Magistrates and Council of the Borough of Perth, to the Appeal of William Ferguson and others, pretended Provost and Magistrates of the said Borough, was brought in. Pemberton's Bill, Motion to shorten the Time for meeting of the Committee. 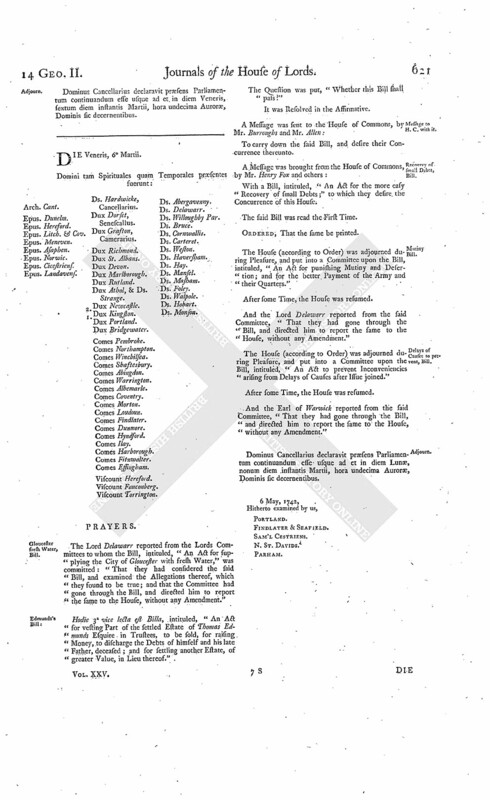 The House was moved, "That the Standing Order, requiring Fourteen Days Notice to be given of the Meeting of Committees upon Private Bills, may be so far dispensed with, as that the Committee to whom the Bill, intituled, "An Act for vesting Part of the Estate of Francis Pemberton Esquire, in the County of Cambridge, in Trustees, to be sold, for discharging the Encumbrances thereon; and for settling another Part of his Estate to the Uses, and for the Purposes, of his Marriage Settlement," stands committed, may meet on a sooner Day than was at first appointed, in regard this Session of Parliament is far advanced." Hodie 2a vice lecta est Billa, intituled, "An Act to enable George Viscount of Garnock to sell Lands, in the Counties of Dunbarton and Air, for Payment of Debts charged thereupon; and to purchase other Lands, to be settled to the same Uses as the Estate to be sold is settled." Their Lordships, or any Five of them; to meet on Tuesday the 24th Instant, at the usual Time and Place; and to adjourn as they please. Motion also for shortening that Committee. 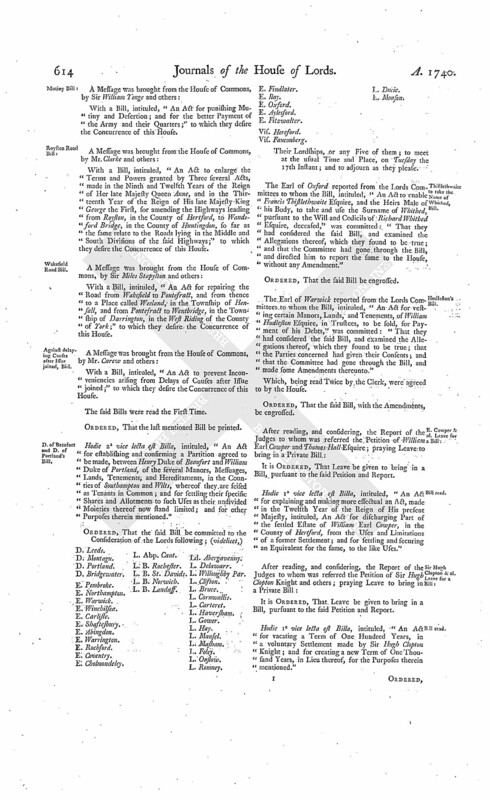 Then the like Motion and Order was made, in relation to the shortening the Time for meeting of the said Committee, as was upon the first mentioned Bill. The House being moved, "That a Day may be appointed, for hearing the Cause wherein William Ferguson and others are Appellants, and James Crie and others Respondents:"
It is Ordered, That this House will hear the said Cause, by Counsel, at the Bar, on this Day Fortnight. Hodie 3a vice lecta est Billa, intituled, "An Act for punishing Mutiny and Desertion; and for the better Payment of the Army and their Quarters." "Because it does not appear to us, that the Forces which are now kept up within this Realm are to be employed to annoy our Enemies Abroad: And we are satisfied, the Affections of the People to His Majesty and the Protestant Succession, are such, that there can be no Occasion for them to keep this Nation in Awe. Hodie 3a vice lecta est Billa, intituled, "An Act to prevent Inconveniencies arising from Delays of Causes after Issue joined." Hodie 3a vice lecta est Billa, intituled, "An Act for supplying the City of Gloucester with fresh Water." Burnett against Magistrates of Aberdeen. Ordered, That the several Reports from the Committees to whom Bills relating to Turnpikes have been committed, which were appointed to be received To-morrow, be received on Thursday next; and that the Cause appointed to be heard on Wednesday next be put off to this Day Sevennight; and the Cause which stands for Friday next to the Wednesday following. Dominus Cancellarius declaravit præsens Parliamentum continuandum esse usque ad et in diem Martis, decimum diem instantis Martii, hora undecima Auroræ, Dominis sic decernentibus. 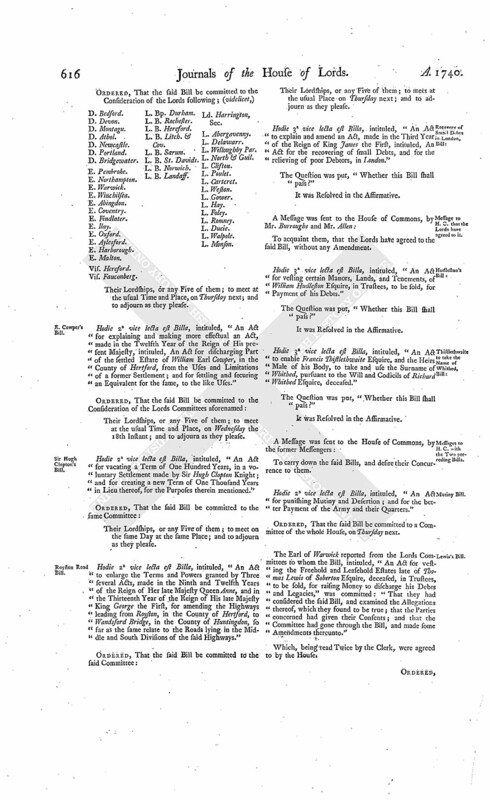 With a Bill, intituled, "An Act for enabling the Right Honourable Charles Earl of Arran to raise Money, by Sale or Mortgage of Part of his Estate in the Kingdom of Ireland, for Payment of Debts, and for other Purposes;" to which they desire the Concurrence of this House. With a Bill, intituled, "An Act for finishing and compleating the Parish Church of Gainsborough, in the County of Lincoln;" to which they desire the Concurrence of this House. 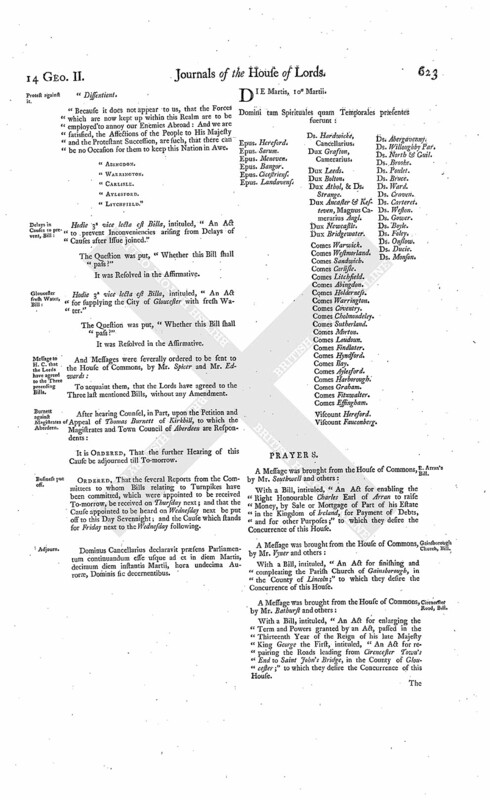 With a Bill, intituled, "An Act for enlarging the Term and Powers granted by an Act, passed in the Thirteenth Year of the Reign of his late Majesty King George the First, intituled, "An Act for repairing the Roads leading from Cirencester Town's End to Saint John's Bridge, in the County of Gloucester;" to which they desire the Concurrence of this House. The King's Consent signified to Earl Arran's Bill. The Duke of Newcastle acquainted the House, "That His Majesty, having been apprized of the Contents of the Bill relating to the Earl of Arran, had commanded him to signify to their Lordships, that His Majesty had no Objection to their proceeding on the said Bill, in such Manner as they should think fit." Ordered, That the said Committee may meet on the Consideration of the said Bill on Monday next. and on Vis. Garnock's Bill. 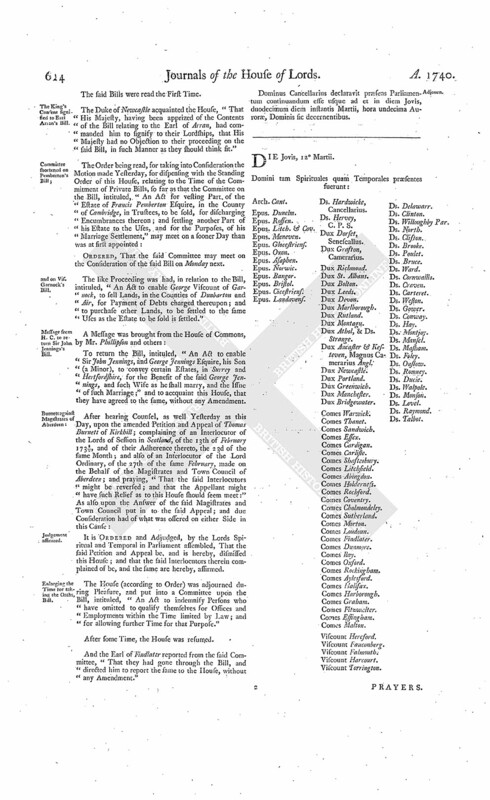 The like Proceeding was had, in relation to the Bill, intituled, "An Act to enable George Viscount of Garnock, to sell Lands, in the Counties of Dunbarton and Air, for Payment of Debts charged thereupon; and to purchase other Lands, to be settled to the same Uses as the Estate to be sold is settled." Message from H. C. to return Sir John Jenning's Bill. To return the Bill, intituled, "An Act to enable Sir John Jennings, and George Jennings Esquire, his Son (a Minor), to convey certain Estates, in Surrey and Hertfordshire, for the Benefit of the said George Jennings, and such Wife as he shall marry, and the Issue of such Marriage;" and to accquaint this House, that they have agreed to the same, without any Amendment. It is Ordered and Adjudged, by the Lords Spiritual and Temporal in Parliament assembled, That the said Petition and Appeal be, and is hereby, dismissed this House; and that the said Interlocutors therein complained of be, and the same are hereby, affirmed. Dominus Cancellarius declaravit præsens Parliamentum continuandum esse usque ad et in diem Jovis, duodecimum diem instantis Martii, hora undecima Auroræ, Dominis sic decernentibus. 1. There follow Two Blank Pages here in the Original.